Loss of facial hair for a man especially in the beard area. Traction alopecia is usually due to excessive pulling or tension on hair shafts as a result of certain hairstyles. It is seen more often in women, particularly those of East Indian and Afro-Caribbean origin. Hair loss depends on the way the hair is being pulled. Prolonged traction alopecia can stop new hair follicles developing and lead to permanent hair loss. This hair loss is generally caused by chemicals such as those used to treat cancer. Initially, it causes patchy hair loss, which often then becomes total hair loss. The good news is that when you stop using these chemicals the hair normally grows back (usually about 6 months later). Other drugs also can cause hair loss. Many medicines used to treat even common diseases can cause hair loss. 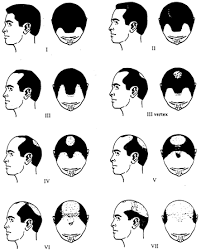 Scarring alopecia is caused by permanent damage to the hair follicles. A form of hair loss where more than normal amounts of hair fall out. There is a general ‘thinning’ of the hair. Unlike some other hair and scalp conditions, it is temporary and the hair growth usually recovers. It is when a person (child or adult) twists or pulls his/her hair, eyebrows or lashes until they come out.